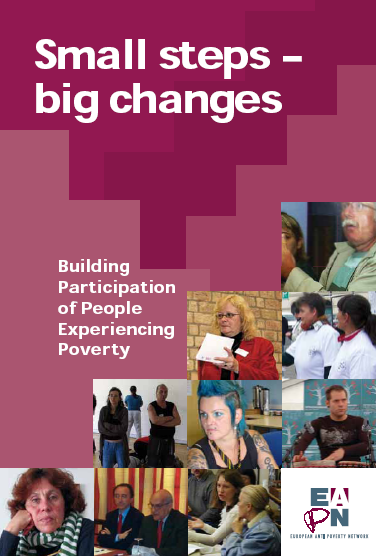 Small Steps – Big Changes presents 10 case studies from members of EAPN on the participation of people experiencing poverty and social exclusion. This publication highlights the diversity of approaches among members of EAPN to participation of people experiencing poverty and social exclusion in community work, in our own organisations and in policy and decision-making. This publication gives visibility to 20 years of EAPN members’ experiences that have been multiplied via projects, structures and exchanges. What is our definition or understanding of participation? In what context did the experience emerge? What have we achieved? What impact has it had on the national network? Small Steps – Big Changes shows that successful participation is possible. This publication should prove a useful tool for all actors concerned, in particular NGOs and public authorities, to foster the direct participation of people experiencing poverty. “Participation is an opportunity for development and for making dreams come true. It is like scales that our tandem, the professional and the person living in poverty, have to keep in balance. You become a diamond from gravel by polishing each other” – Zoltane Szvoboda, from Hungary.